"Alexa, open The Metaphysical Hour"
Julia was born in Hutchinson, Kansas to Johnny and Dolores Cannon. Johnny was a career Navy man, so they moved frequently and she had the advantage of an open-minded up-bringing. She was raised with the understanding that psychic phenomenon and metaphysics were common place and she was always exploring new avenues of growth. Julia became a registered nurse and worked in Intensive Care and Home Health for the duration of her 20+ year career. 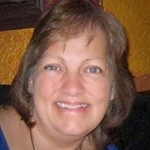 She then decided to explore other aspects of the healing profession and has trained in Reconnective Healing and Dolores Cannon’s Quantum Healing Hypnosis Technique. Her energy healing has taken on its own dimension and has formed into something she calls “Lightcasting.” Intuitive lights come from the hands and eyes to direct energy where it is needed to balance any deficiencies in the body. This balancing may be happening on the physical, mental and/or spiritual level. While she is working in someone’s energy field, she gets intuitive messages/impressions of what is happening and what is needed to help the person bring about their healing. When Julia does remote energy work, she is taken intuitively inside the body to see what the condition looks like and then she is given methods to correct the situations. This has been a spontaneous development that continues to amaze her in its applications. Because of her nursing background, Julia brings a soothing mix of empathy, human body understanding and intuition to her work. She is available to do energy/light work in person and remotely. Julia has now written about what she has learned from working alongside of her mother Dolores Cannon in how the body communicates a special language to us. This book is "Soul Speak - The Language of Your Body." Her intuitive abilities continue to grow and she is very excited to share and help others to discover and develop their innate, natural abilities.